Take 3 sheets of filo pastry at a time. Cut in half so you have 10 x 12.5cm/4–5 inch squares. Take one square and brush with a little melted butter or margarine. Place another square on top at an angle, and brush again. Do the same with a third sheet. 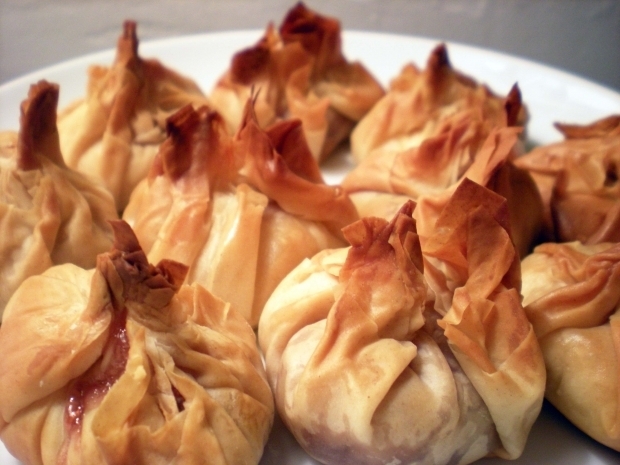 Place a teaspoon of cream cheese in the middle of the filo pastry and top with a teaspoon of cranberry sauce. Bring the edges of the pastry up together and pinch them to form a little parcel (money-bag shape). Make up the rest of the parcels in the same way. Brush with melted margarine and place on a greased baking tray. Bake in the preheated oven for 15–20 minutes until the pastry is crisp and golden. Serve hot with extra cranberry sauce.